I took all of these pictures back on April 15th and am just having an opportunity to post! It has been an exceptionally busy week so I haven’t had any time to get this shared. First – the biggest work was along the road. In the past few years, I’ve put potatoes in along the road. But, with the cost of potatoes being so cheap, it just wasn’t worth continuing to spend hours digging potatoes. In addition, we have Zoysia grass in our yard and it was beginning to take over the area. So one way or another, this area was going to need an overhaul. Because our yard goes downhill towards the road, it took a lot of time to slope the area, re-plant grass seed, cover the grass seed with soil, then cover it with some yard clippings (from when I mowed the week prior). While the picture above is now outdated, there is quite a bit of green grass that has already sprouted so it is coming along! 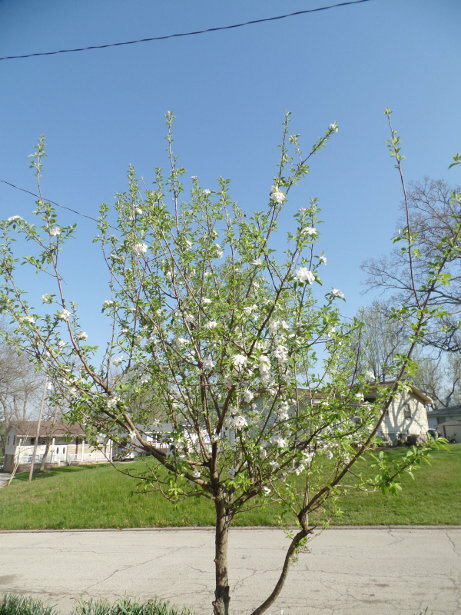 Quick picture of the granny smith apple tree in the front yard. It was planted many years ago and sold to us as ‘ready’ to start giving us apples, but it seems that all of the apples have been aborted and fall to the ground before ever reaching maturity. But the flowers in the spring are nice. 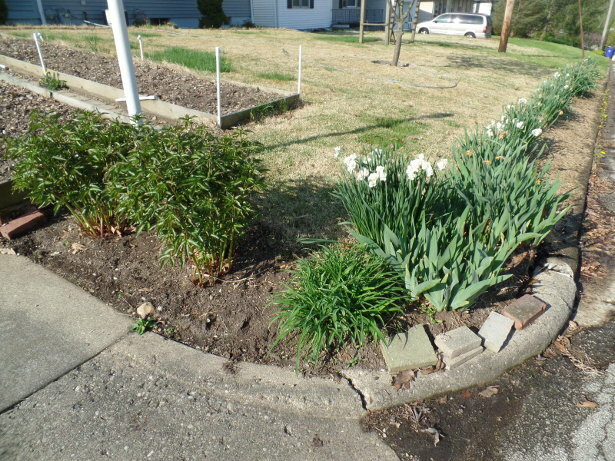 And by the curb of the road and the driveway, the peony plants are coming up well along with the iris bulbs. 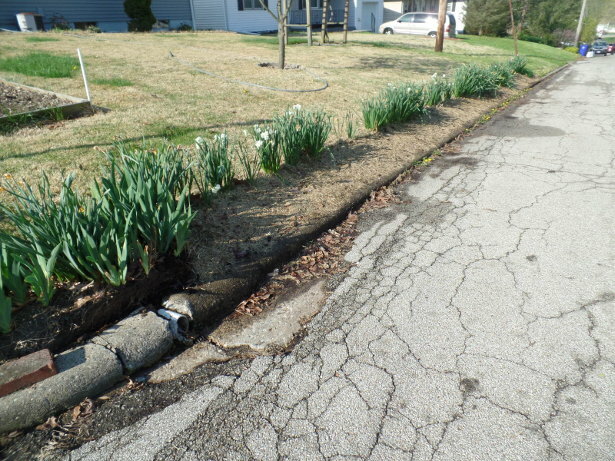 All along the front yard is daffodils (all flowers are gone now). Back inside at the germination station, the Best Boy tomatoes have sprouted! 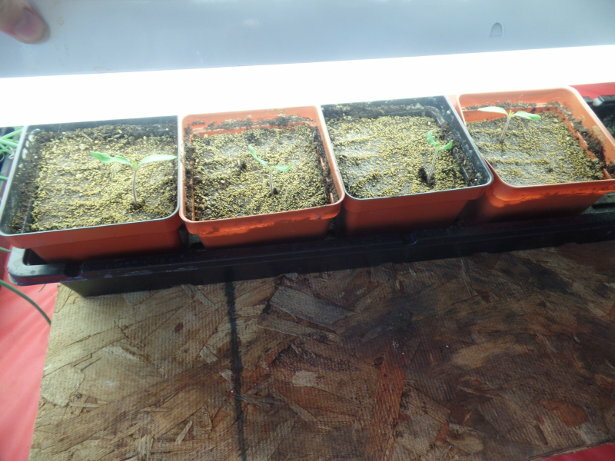 Four of the eight seeds sprouted (at the time of the picture below) but two additional seeds sprouted – so a germination rate of 75%. I need to get the two seedlings pulled out and put in their own container before they get much larger. 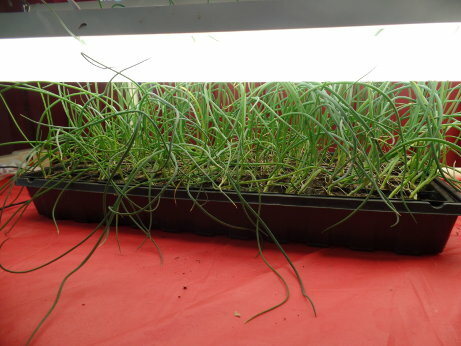 The onions need to be planted outside – as they are getting long. Some folks will actually cut the tops of the onions back – as I’ve read on other blogs and forums. I guess I just let mine continue to grow. 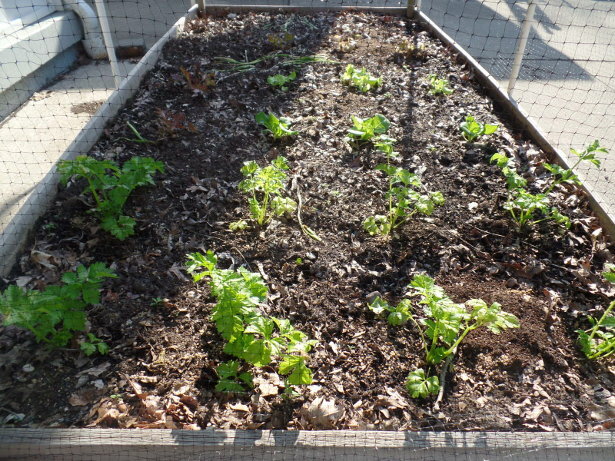 Outside – the celery and variety of lettuce are doing OK. The lettuce has doubled in size in just a week (compared to what they look like now versus the picture below). And the original onions that were planted outside a few weeks ago are still going strong. Not one has died yet, which is a first! What else… well, the peas were all seeded next to the house – I think that was done on Sunday. I can’t recall with it being so busy this week! Last year, we had – what appeared to be a beaver – eating away at all the pea plants and we got nothing. Will see what happens this year! 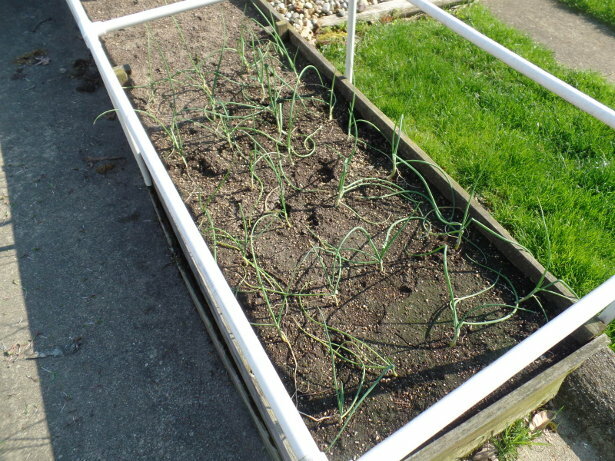 Oh, and also on Sunday, I put up a new type of deer netting around the front garden. Again, need to get some updated pictures for the things that have already happened since writing this! The deer netting seems to be much thicker than the other stuff I was using and it came in a 7-foot by 100-foot roll. I used rebar that was about six feet high as the posts to hold it up (better than the wood I used in year’s past). I’m hopeful that with the thicker fencing/netting and better posts that it will keep the deer out this year. If it doesn’t, there honestly isn’t much of a point to having a garden anymore! One full side of the front garden was seeded with Bush Blue Lake 274 green beans – and the other side will have the six tomato plants.